There are lots of car races held around the world, and one of the biggest in America is the NASCAR series. A Tasmanian, Marcos Ambrose, became the First Australian to win a NASCAR race when he won at Watkins Glen International (see his car above), and is now (2011) racing with Richard Petty Motorsport. 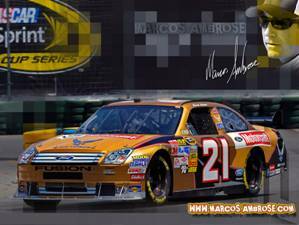 Since leaving his home town of Launceston, Marcos won the Australian V8 Supercar championship twice before achieving success in America. However we are a long way from America, car racing can be dangerous, and most of us are a bit young anyway, so let us have fun with our Robots instead – we don’t need a driving licence to race these! Your Robot will probably be built like Robot2 with a sound sensor attached (see Challenge 20). However if your teacher or mentor agrees, you can use any type of LEGO Robot you can build to go around this race track as quickly as it can – the main idea is to have fun learning how to teach your robots to do what you want them to do. Your Robot has to complete 1 lap of the course, returning to its start line. A Robot’s race ends if it completely leaves the arena during a race. A Robot’s race ends if it has not completed 1 lap within the time limit of 1 minute. Think about where you want your Robot Racer to go after it starts. What is the easiest way to instruct your robot to get around the central wall? 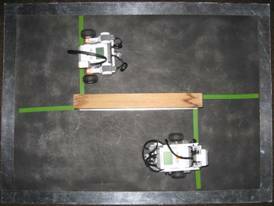 What is the easiest way to teach your robot to stay straight so that it does not bounce off the central wall or go over the edge of the Arena? What is the easiest way to teach your robot to go around the course really really fast?? Is the easiest way the best way? Is your robot securely built – will it fall apart before finishing two laps? The Robots could be started on opposite sides of the race track (as shown above) and started by a hand clap. The best Robot could be the one that completes two laps in the shortest time. If neither Robot completes two laps, the Robot that has gone the furthest in two minutes is the better Robot. If both Robots leave the track, the result is a draw! But as we said above, feel free to change these rules if your teacher or mentor agrees, even make up your own if you like! Go build your Robot Racer! Mentor/teacher notes in Microsoft Word 2003 format relating to the background of car racing and this Challenge 22 can be seen by clicking here, NXT-G programming notes are here, and a two-page version of this Challenge is here.